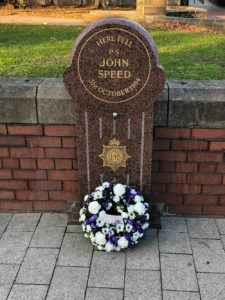 West Yorkshire Police Federation attended a memorial for Sgt John Speed on 31 October, and laid a wreath in his memory. John was killed when he confronted a gunman as he went to help a colleague who had been shot and wounded while investigating two men acting suspiciously in Leeds. He was posthumously awarded the Queen’s Commendation for Brave Conduct.